Poor acoustic venue, how you can avoid it. A poor acoustic venue can spoil even your finest performances. Excellent sound reflection helps musicians hear better, so tone, timing, and balance can be perfect in any environment. An acoustic shell (also known as a choral shell or bandshell) is a curved, hard surface that reflects sound towards an audience or performers. 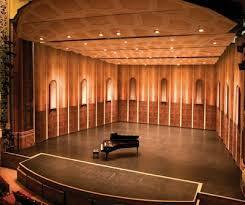 Acoustic shells are designed to improve the sound, look and function of any performance center. Most importantly, an acoustic shell allows performers and audience to hear with greater clarity. Most acoustic shells are designed to be removable, either rolling away on wheels or flying into a fly space. They are commonly used for orchestras, bands and choirs, although they can also be used in any application that requires passive sound amplification. The shells are generally made of hard materials because they are designed to absorb as little sound as possible. There are many different types of acoustical shells out there in the marketplace and choosing the right one for your venue is an important decision. Wenger pioneered acoustical shell design and their latest addition, the Diva™ Acoustical Shell, is a cost-effective acoustical solution for small- to medium-size performance spaces that delivers impressive full-stage acoustics, a beautiful visual appearance, and ease-of-use — all at an affordable price. Looking for an effective acoustics solution for your outdoor performance? Then an inflatable acoustical shell may just be what you need. It inflates in minutes and provides impressive acoustics to help project sound to a larger outdoor crowd. They are also an impressive and festive centerpiece for any event – and are so easy to transport and setup, requiring only two capable crew members and a few minutes. If you are a traveling performance group, you may want to look into an acoustical shell solution that is easily transportable and can be stored in small spaces, such as the Travelmaster Acoustical Shells. Remember: choosing the right acoustic treatment for your theatre venue is vital to a show’s success. After all, performers and audiences deserve the best your venue is capable of delivering.